[News from the News Center] On the morning of June 26, Professor Wang Zhonglin, a leading international nanotechnology scientist, a foreign academician of the Chinese Academy of Sciences and a member of the European Academy of Sciences, came to YSU and brought an academic report entitled “Piezotronics and Piezo-phototronics” to YSU teachers and students. 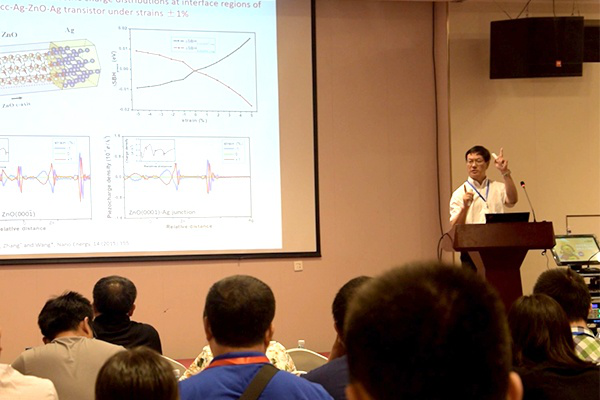 The report was hosted by Liu Yong, Dean of the School of Science. Teachers and students are listening to the report. In the report, Wang Zhonglin made a systematic explanation ranging from the physical principles and basic theories of piezoelectric electronics and piezoelectric optoelectronics to the design, manufacture, testing and application of basic device units. The basic concepts and principles of piezoelectric electronics and piezoelectric optoelectronics were first proposed by Wang Zhonglin's research group in 2007 and 2010 respectively. They have become the advanced and frontiers in nano-science and technology research, particularly promising in the fields of human-machine interface, active sensors, Piezoelectric electronics and piezoelectric optoelectronics, active flexible electronics, micro-robots, intelligent electronic signatures, intelligent micro-nano electromechanical systems, and energy technologies. Wang Zhonglin's report is engaging and easy to follow, especially the report content is forward-looking and leading, which expands attendants’ academic horizons. Academician Wang Zhonglin has consistently carried out research, his innovative spirit on the road of scientific research is worthy of respecting and learning by every YSU students. Wang Zhonglin is a Tenure chair professor and Board member of the Georgia Institute of Technology Lifetime School, Professor of Hightower Tenure chair professor, Chief Scientist of the Beijing Institute of Nano Energy and Systems, Chinese Academy of Sciences: Foreign Academician of the Chinese Academy of Sciences, Academician of the European Academy of Sciences: Fellow of the American Physical Society ), Fellow of the American Association for the Advancement of Science (AAAS), Fellow of the American Society for Materials Research, Fellow of the American Society of Microscopy. He invented nanogenerators and developed its technology roadmap. His research on self-driven nanosystems has stimulated extensive research in the world of academia and industry on power supply issues in micro-nano systems, which has become a featured discipline in energy research and future sensor network research. By introducing a charge-transfer process controlled by piezoelectric potential in novel electronic devices and optoelectronic devices, he pioneered and led the development of piezoelectric electronics and piezoelectric optoelectronics, which are in intelligent MEMS or nanoelectro-mechanical systems, nanometers. It has important applications in robots, human and electronic interface and sensors. His work has been cited more than 52,000 times, and the h-index of the paper cited is 110.